In this tutorial I will show you a quick way to create custom shapes in Photoshop using a selection. All you have to do is make a selection of an object, refine the selection edge, turn to work path and finally define custom shape. All this in 5 minutes opposed to let's say 20 minutes if you decide to draw the silhouette from scratch using the Pen Tool. The time depends a lot on your vector drawing skills. So you can make custom shapes using selection of a raster image. From this tutorial you will learn how to make a Photoshop shape from raster images using the selection tools. You can create in this way so many custom shapes with less effort and pretty good results. A custom shape in Photoshop is drawn using the Pen Tool or using the Ellipse Tool, Rectangle Tool or combining other custom shapes. So when I say custom shape in Photoshop I am thinking of a shape drawn by hand from scratch using one of the vector tools available. If you want to learn this first method, that in my opinion is the better one, read this tutorial on how to create custom shapes in Photoshop. But there is also another way to make custom shapes that is much easier and used by many people. But if you use this method in a wrong way you obtain a poor quality raster image, not a vector shape, with lots of anchor points. So here I will explain you the right way in which you can create shapes from raster images using selections. You can make shapes from any raster image but the main idea is to obtain a shape with less effort. For that you have to choose images that can be extracted from the background easily. For example birds on a clear blue sky, silhouette images, cut out images, cut out PNG and so on. I will use this Cat Moon Silhouette to create a vector silhouette. Use the Magic Wand Tool to select the Cat Moon Silhouette background. Adjust the Feather accordingly to your image. Keep the SHIFT key pressed to add to the selection. Press SHIFT+CTRL+I to inverse the selection. Here comes the important part. When you are trying to make shapes from selections, you have to use hi res images. After you make the selection, it is important to go to the Select>Modify and choose Feather. The feather radius depends on your image size and shape details. If you choose a greater number for the feather radius your shape will have less anchor points (which is a good thing) but at the same time you can loose some important shape details(which is not good). So you have to choose the right amount. For this image I will use 3 px for the radius. Right click on the selection and choose Make Work Path. Pick the Path Selection Tool and right click and choose Define Custom Shape. If you open the Custom Shape Picker you can see the shape that we have just created. Right click on the shape and choose rename if you want to change its name. If you want to create more detailed custom shapes you can draw them using the Pen Tool. So you might want to check out these Pen Tool Photoshop tutorials. This set contains 1 layerd PSD file that will allow you to create a vector shape silhouette out of any photo/graphics/image. The pack also contains a Photoshop action that you can use to create custom shapes. You can also try this Photoshop action that turns any JPG image into vector using Photoshop. The results is a complex vector image with colors and not just a vector shape silhouette. 10 comment(s) for "Create Custom Shapes from Image Selection in Photoshop"
That's it? Geez! All this time I have been fearing learning how to make shapes. You make it look so easy! Thank you for your tutorial on the making of custom shapes. I do have a question though. Why is it detrimental to have too many points in your work path. What does it effect and how? Thanks again for getting me started off with the shapes. If you are creating the shape manually with the Pen Tool having to many anchor points is not detrimental. However if you are making a custom shape from a bitmap raster image you will obtain a shape with a jagged edge which doesn't look very nice. When you make a selection or remove a background using the Magic Wand Tool or the Quick Selection Tool you always obtain a jagged selection. That is why is necessary to use the Feather Selection option(see the image attached). Hi! I did it! LOL I used a paper doll image to get the path that made the 'grandparents'. It was so easy! 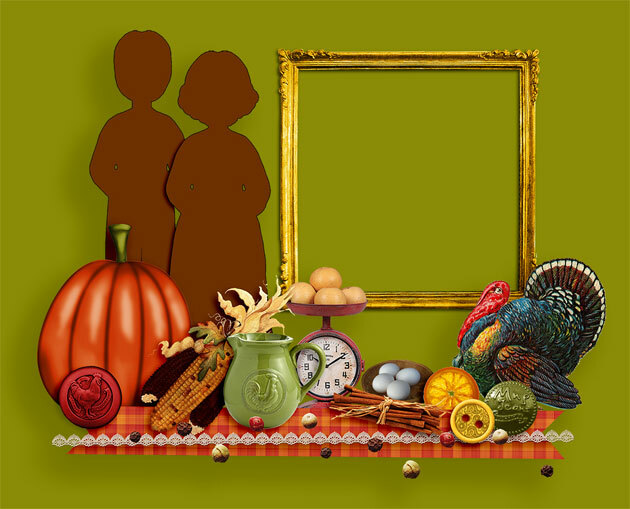 I show the shapes in a small vignette I created for Thanksgiving.